More high-altitude exploring, this time on the Bolivian altiplano, where John looks at life in some of the Andes’ most isolated villages. 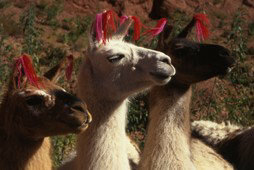 From dazzling salt pans near the Chilean border he joined a llama caravan to a market town where salt has been bartered since Inca times. En route he discovered dinosaur tracks, and unearthed some fresh evidence about the final days  100 years ago in November 2008  of Butch Cassidy and the Sundance Kid. Click here to listen to John’s BBC Radio 4 programme On the Trail of Butch and Sundance. Click here to listen to John talking about Butch and Sundance on Radio 4s Excess Baggage in November 2008. Listen to Johns From Our Own Correspondent piece about llamas.